Hey everyone! So here is my build thread, I hope you enjoy! 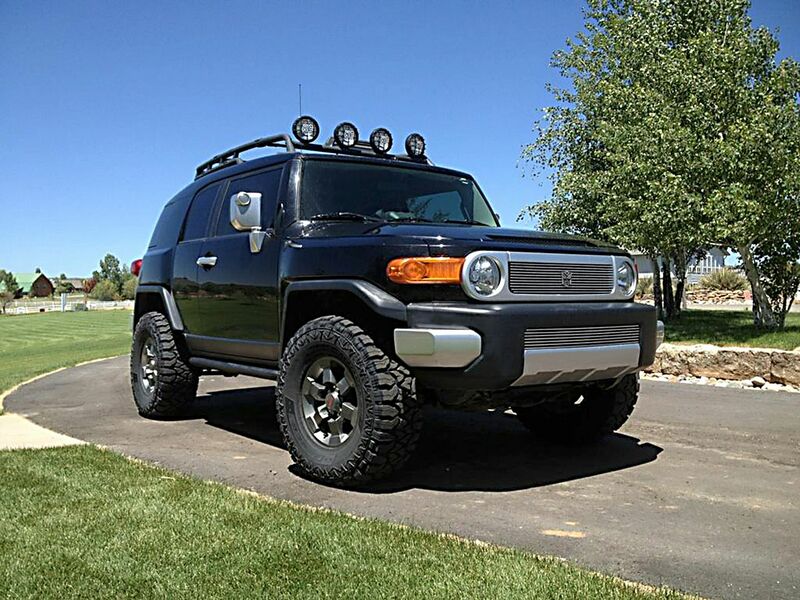 Also this FJ is now sold. 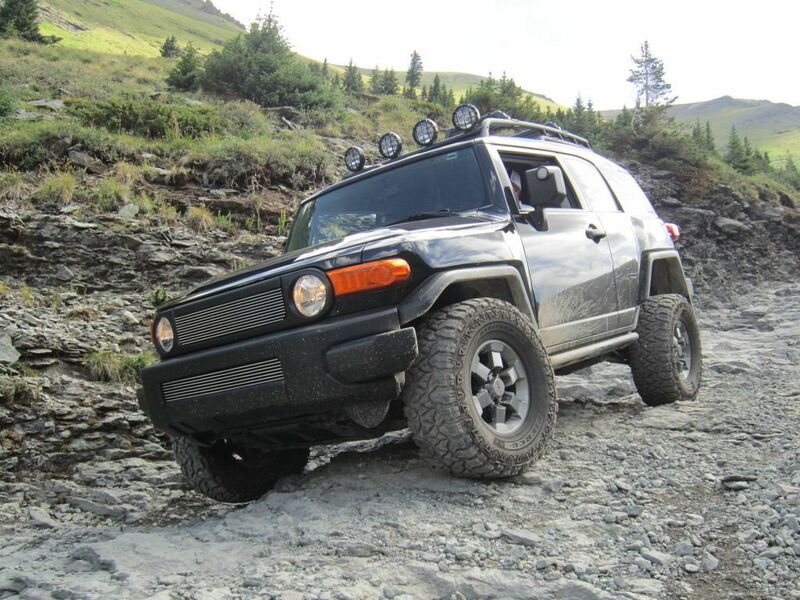 Now here is my rig when I bought it in April of 2011 from a seller in Idaho and I have absolutely loved it! I was so fortunate to get it as my first car! 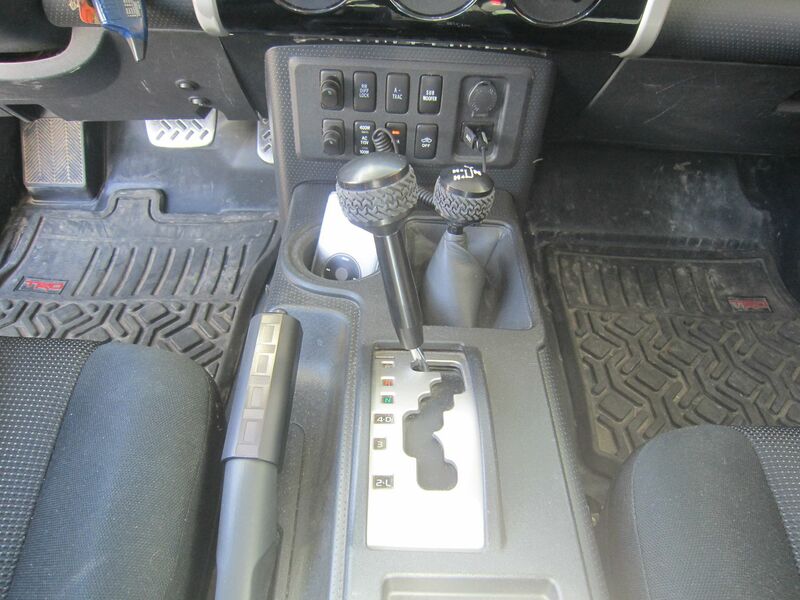 It is a 2007 and is an automatic 4x4 model and it came with the A-Trac and rear locking differential. It came with the awesome TRD Special Edition set up such as: Black Diamond Pearl body and roof paint, TRD gun-metal grey alloy wheels, TRD Cat-back exhaust system, TRD Cold-air intake, TRD labeled all-weather floor mats, TRD SE emblems, OEM rock sliders, and TRD Bilstien suspension which are off-road tuned among other standard features. But it also had the 4 KC Slimlights on the roof rack which are the long range lights as opposed to the driving or fog lights that KC sells. 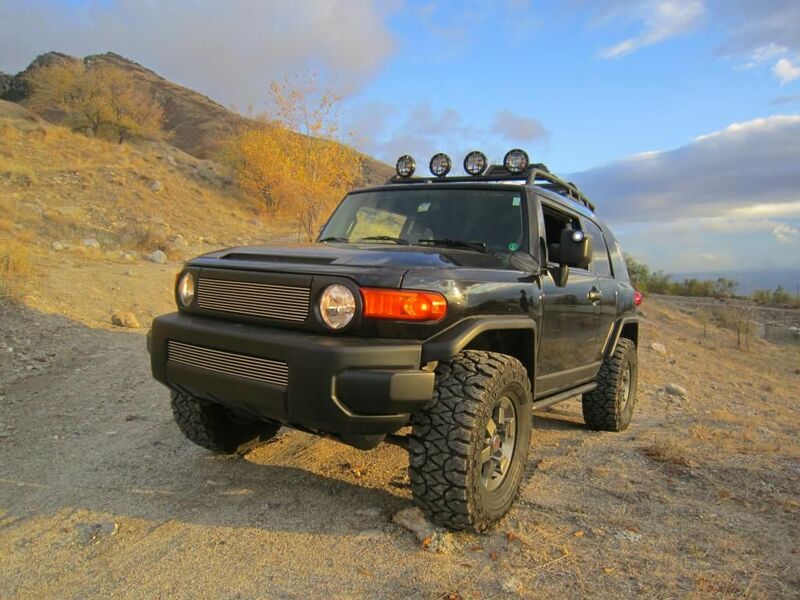 I do not know how many owners this FJ hadbefore me but it became obvious to me months later that one of the previous owners had been the one to install the roof lights. 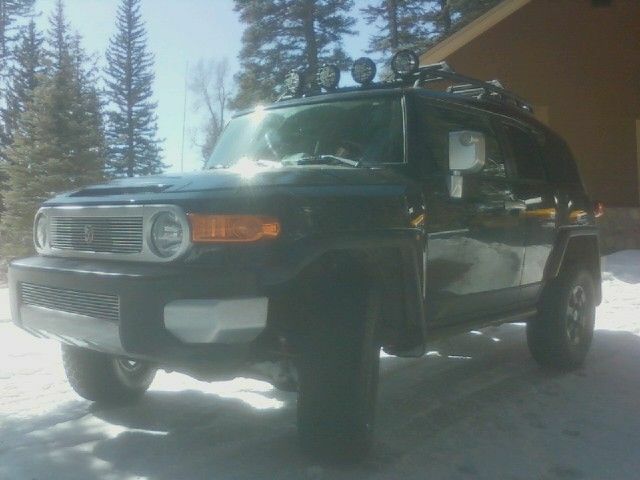 The FJ also came with a Compustar alarm/remote start system installed in it but I didn't get all that hooked up until after owning it for a few months. I actually had to take it to a Compustar dealer so they could replace some faulty wires, the antenna, and order me a remote since my FJ only came with the regular factory key chain remotes. 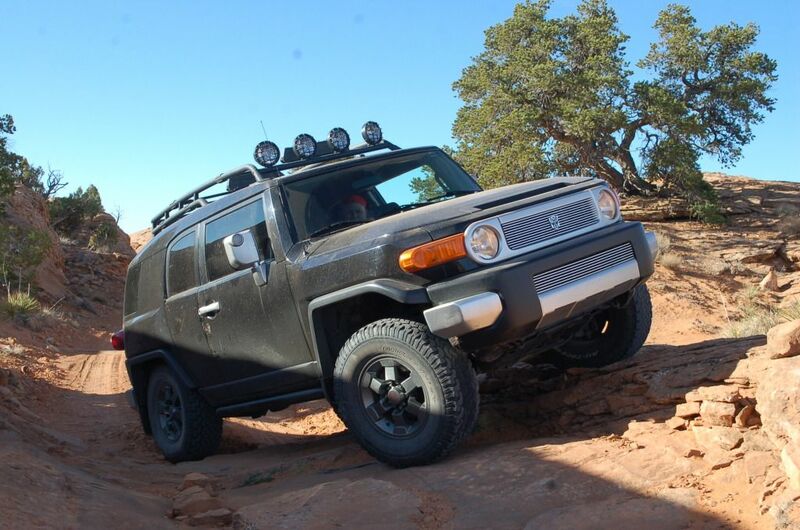 It was also interesting because my FJ had 285/75R16 BFGoodrich All-Terrains on it as opposed to having the 265s that they come with from the factory. So it must have been an upgrade someone had made around the time the car was first delivered or bought at the dealer because of the amount of tread wear that the tires had. But these pics show what it looked like after only 2 weeks of ownership. I snapped these right after I had a somewhat local auto shop put a "leveling kit" on there but because at this point, I had no knowledge really of lifts/leveling kits/etc... they just put some generic spacer lift on there which I had no idea who it was made by but it works and it's what I’m still running with today. However, I'd say it was a ReadyLIFT 3" lift kit after doing my suspension comparison thread and seeing everything available out there. This kit comes with a spacer that goes above the front coilover assembly and it comes with rear coil spacers that fit right on top of the coils. It also came with a diff drop which is in my opinion, a very smart thing to have no matter what kind of lift you are running. Here is a video my friend made for his film class where he had to make a commercial of anything so he chose my FJ. 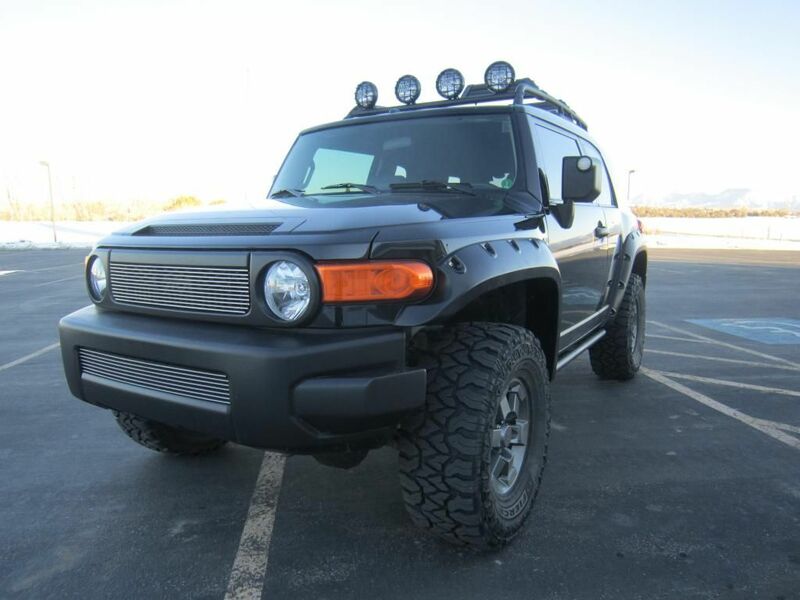 It's not the greatest video and obviously some of the elements of it were just put in there to be silly but it shows what my FJ looked like before I did anything to it. 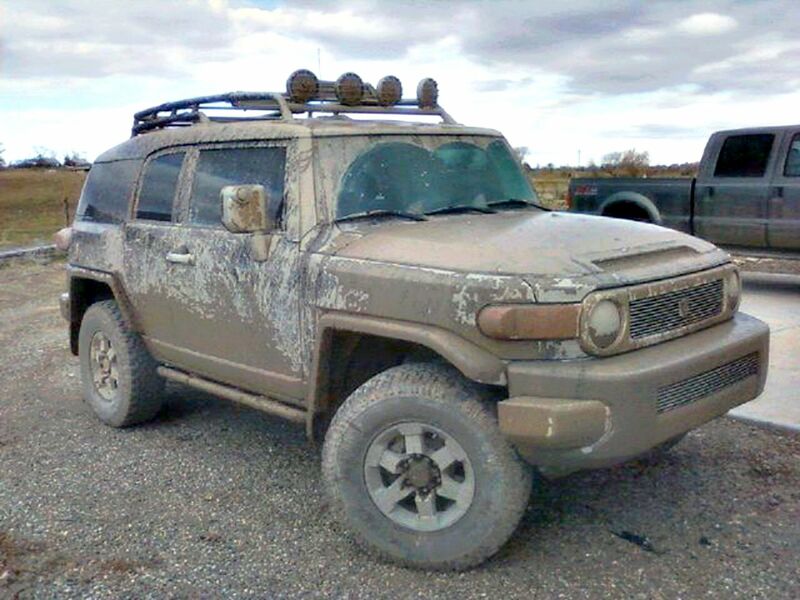 Here I took the FJ to a little mudding spot I know of near where I live. I probably still have mud under my hood from that day! lol There was actually so much mud that the engine service lights on my dash started coming on and when i took it to the dealer they said I had dirty sensors and complained about how much mud there was, WELL DUH! 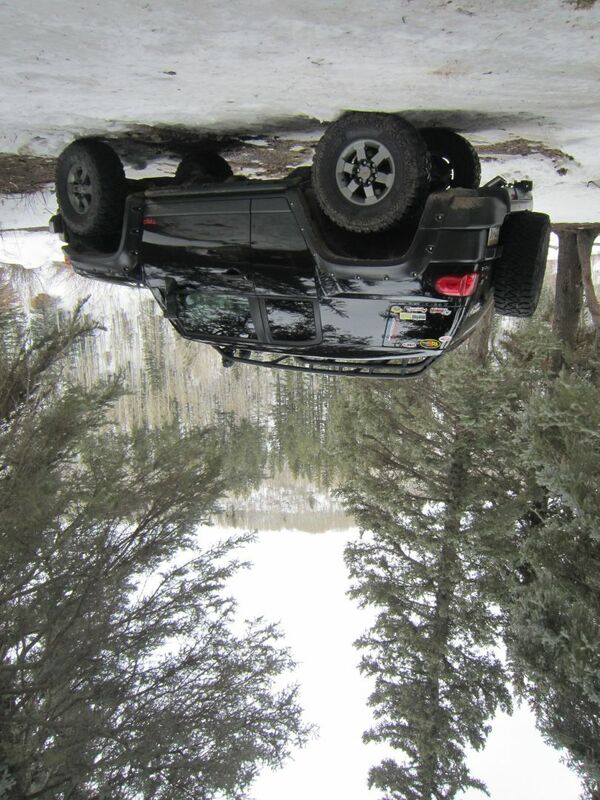 It's a 4-wheel drive vehicle! 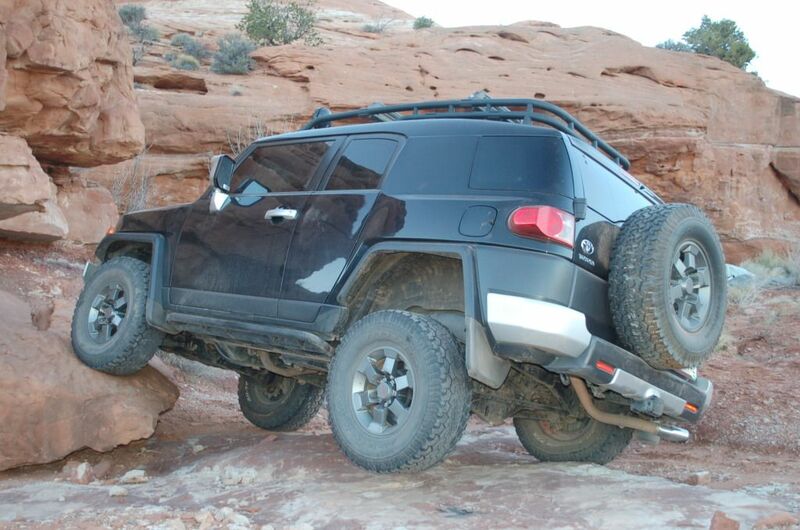 It's meant to be off-road! 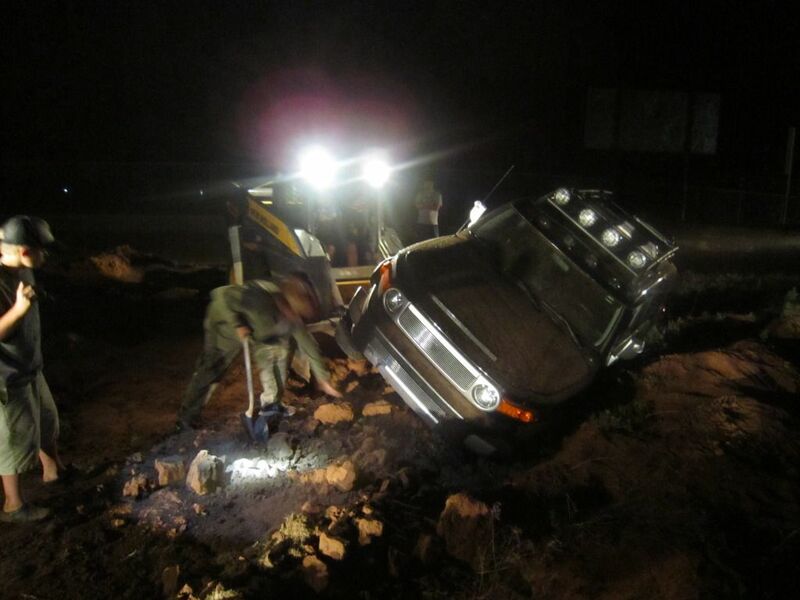 Mud just happens! 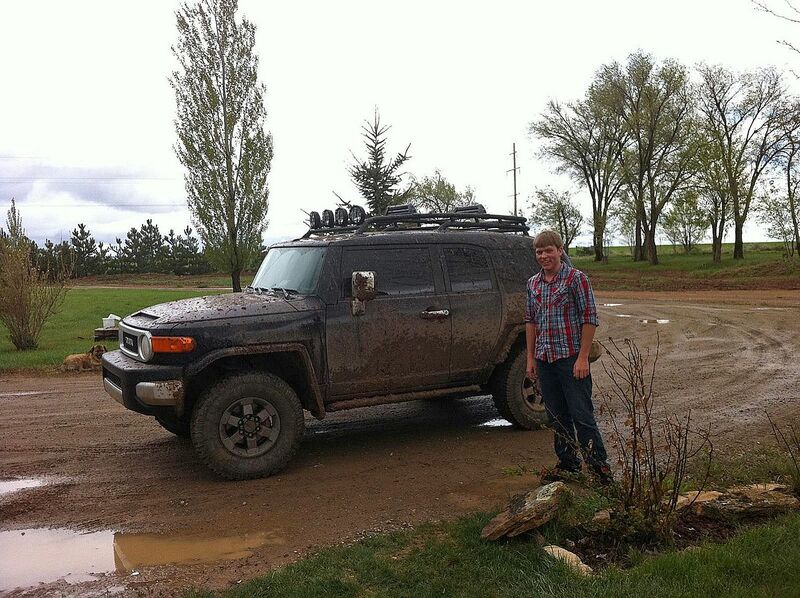 But since those early days of owning the FJ, my mudding has dropped to none since I really hate clean up. 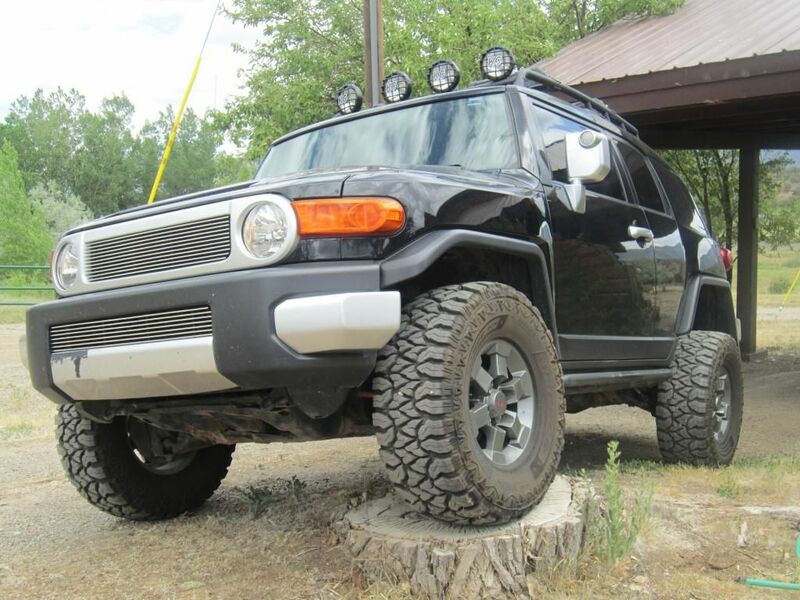 Here are some pictures that show one of the first things I did to my FJ. Because at the time I was SUPER into Transformers, I knew I wanted to make my car a Transformer. So I found some Autobot car emblems online and to make them work well with the car, I said goodbye to the TOYOTA emblem and installed new Carriage Works grilles in both the main grille and bumper grille. They are made from aircraft aluminum so they are pretty durable and I really like the look of them. Plus, they matched the chrome Transformers emblem perfectly! 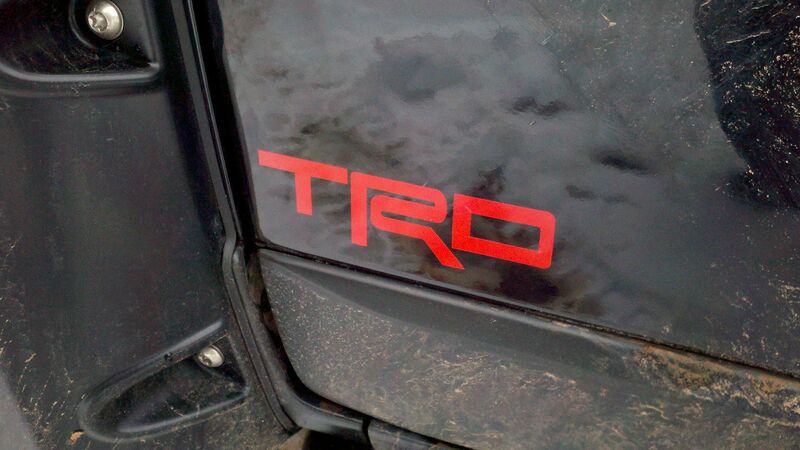 I also mounted a 2nd emblem above the TRD badge on the back door. 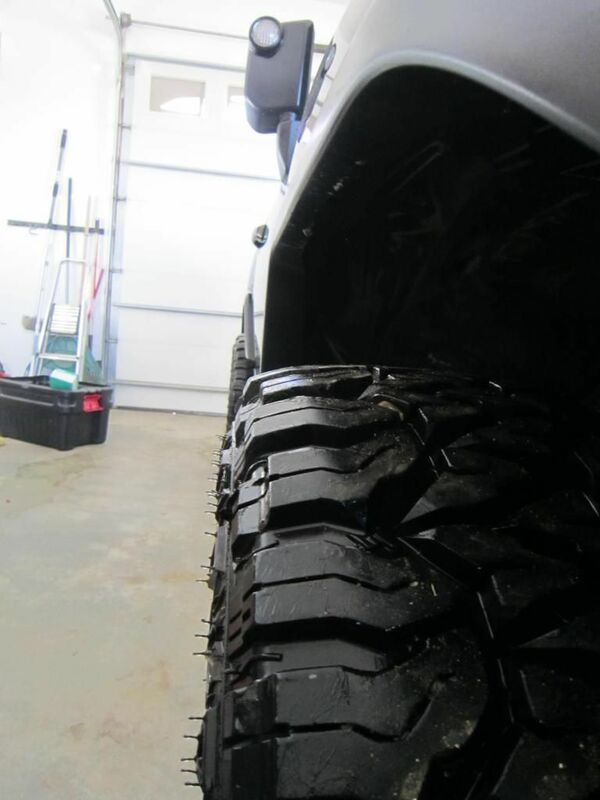 It was a little frightening that winter because of how bald my tires were, but i managed. And sorry for the low quality of the pictures, at this time I only really had my old cell phone but they get better, I promise! At around this time I realized how I really don't like the look of regular halogen bulbs and I really wanted something brighter. So I got LEDS!! I ordered all of mine from superbrightleds.com and they work great! 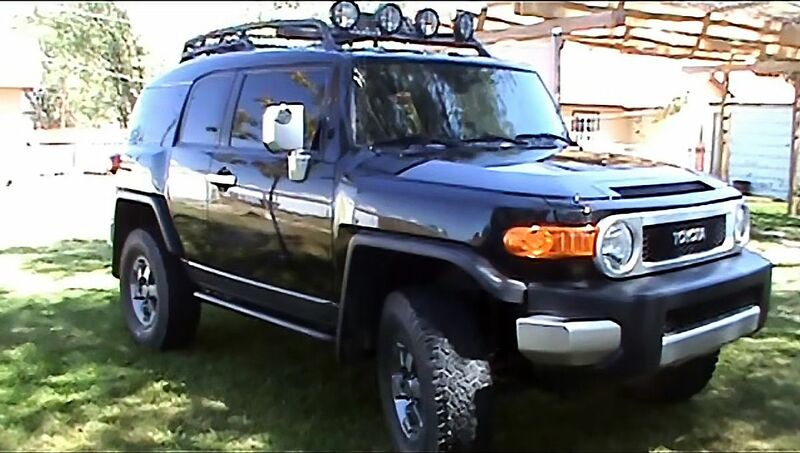 I was able to replace my license plate lights, interior dome lights, reverse lights, and mirror lights with LEDs. What a difference! I chose the "cool white" color option as opposed to the "warm white" and "natural white" colors because I like that more bluish/cooler look to them. I did however choose a "natural white" colored LED for my back up light since I wanted it as bright as possible. Here are some before and after pics showing the mirror light difference. It may not seem like much of a difference but whenever I have my mirror lights on, I can actually tell a difference from when they're on or off unlike before! Here are some pics that I took on the same trip as the pictures taken above. 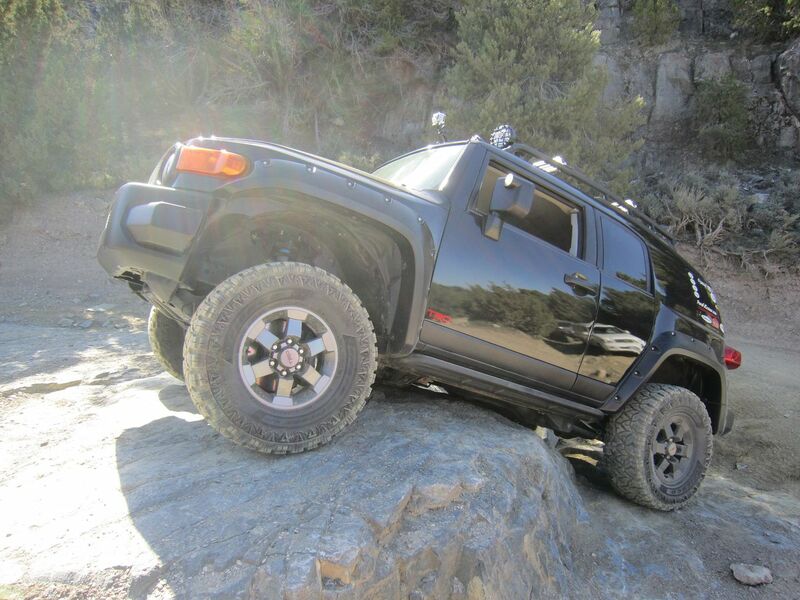 I decided I wanted to do something crazy (for the first time) so I pulled up onto that big rock until that rear left tire came off the ground. This was the first time I got onto only 3 wheels, but it defiantly wouldn't be the last! 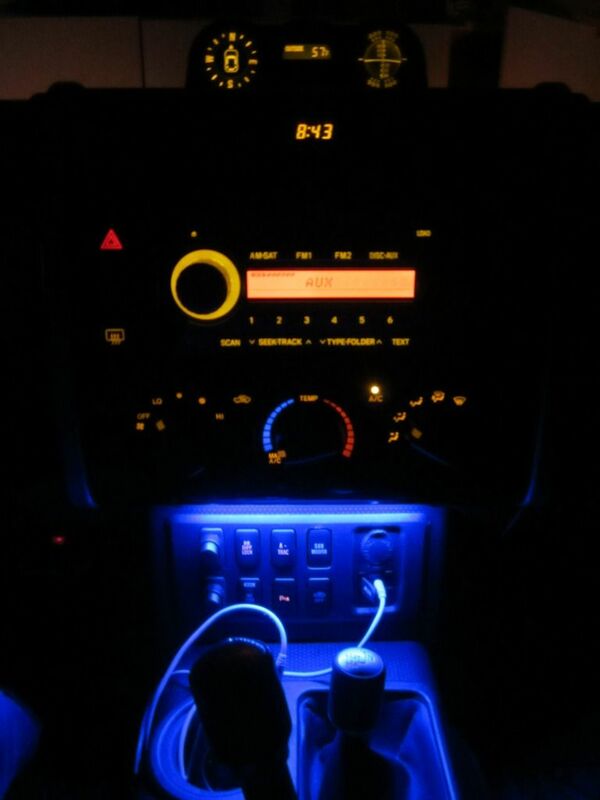 I also decided around this time that I needed a way to add some extra light inside the car at night and to add a cool, unique look to my FJ, so I got these installed by a local audio shop (Audio Box). 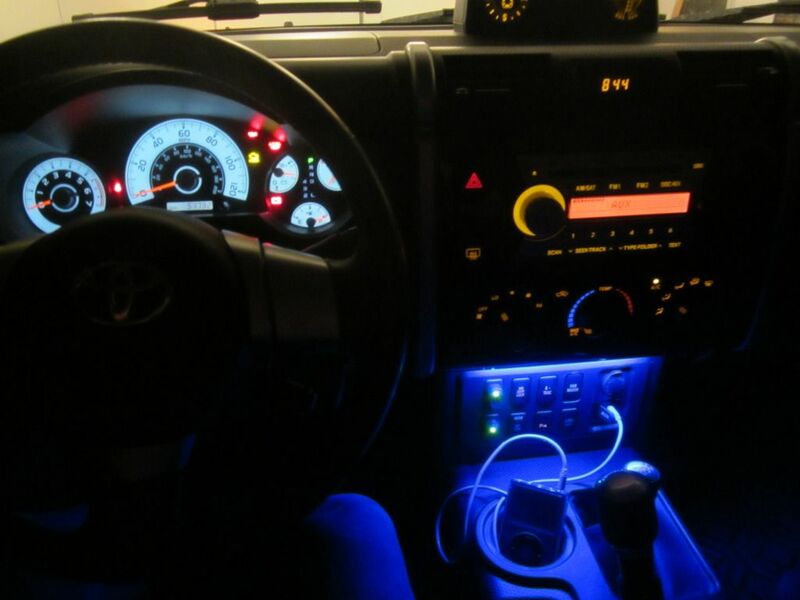 These were two 6 or 8 inch blue LED strips that I picked up from AutoZone and going to a professional to get them installed was such a good idea, that way I didn't have to worry about taking the dash apart or messing up the wiring or anything. Plus in the end, it has a super clean/professional look to it. The switch for it is actually that light red dot you can see in the bottom left hand corner of the picture. It is installed on that plastic piece right under the steering wheel but it's placed off to the right. I've replaced that rocker switch since then with one that has a blue LED in it so it matches the blue LED strips very well! 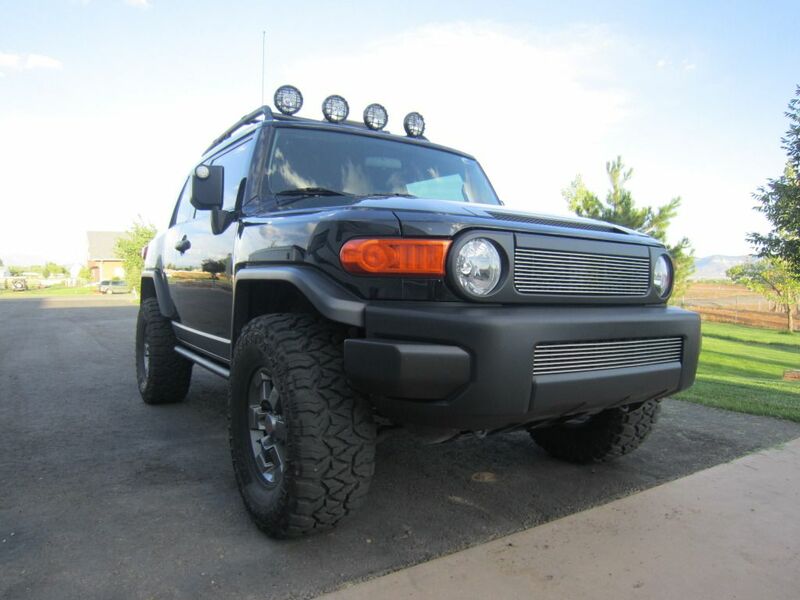 In the end it adds a cool look to the FJ and it helps me see those center console buttons, switches, and my iPod a ton better at night time. Last edited by FJX2000; 12-07-2016 at 03:21 PM. 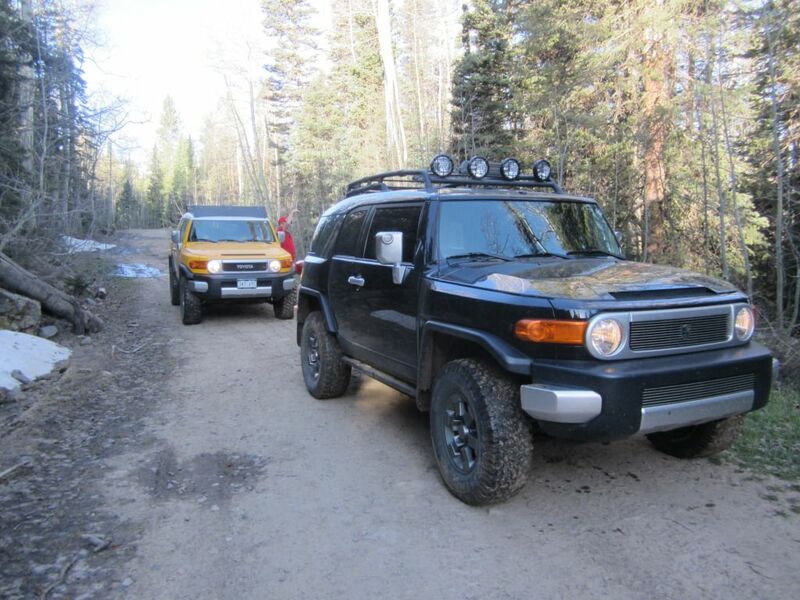 This next picture shows me and a FJ buddy of mine on a trail near where I live called the Willow Divide Trail which is north of Dolores, Colorado. In this picture you can see how some of the front valance paint had started to come off from a little too aggressive power washing. And it only gets worse. And you can tell in the second photo how badly worn my tires were at this point! Plus the tread wear was uneven so I needed an alignment bad! 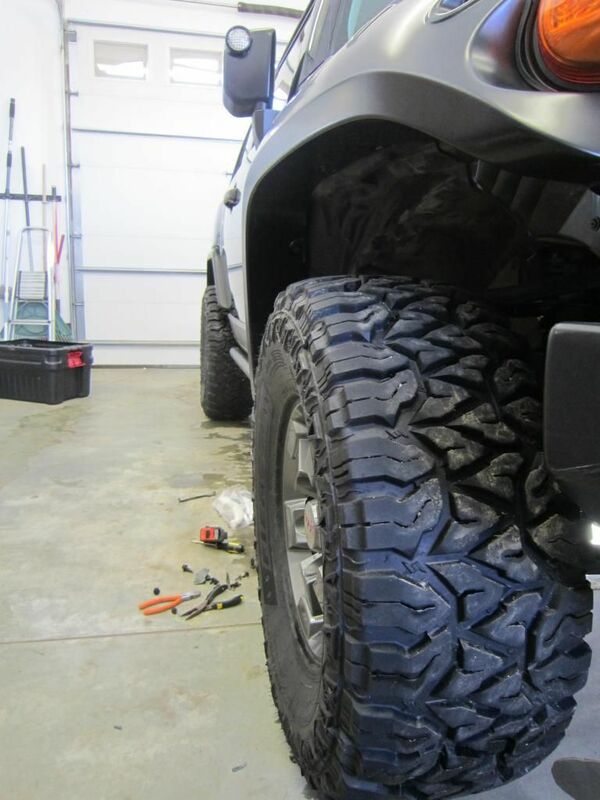 When first looking at new tire options I originally thought about going with Mickey Thompson Baja MTZs after falling in love with the look of them on someones rig in the 33x12.50R17 size, but after I couldn't get any because of national back-order, I moved on to other options. 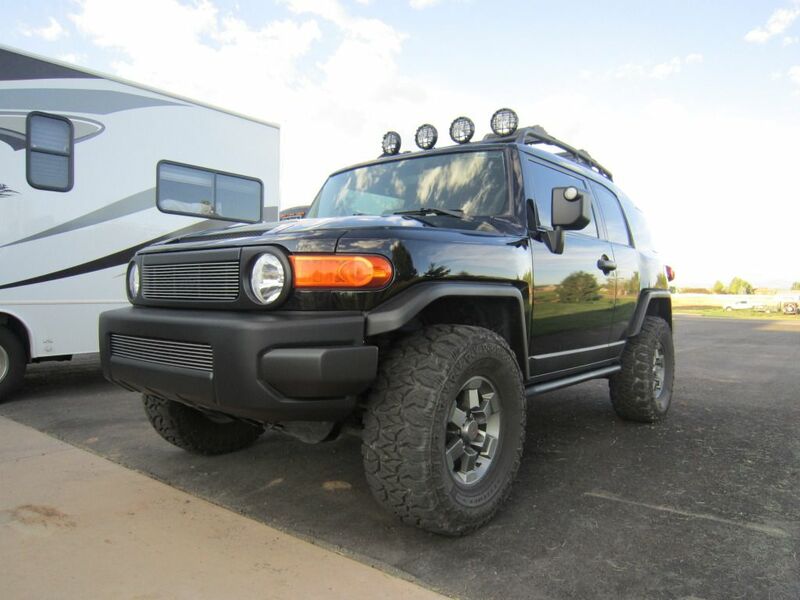 I knew I wanted a mud-terrain tire rather than an all-terrain tire even though it is my daily driver, so it was important that the tire I was to choose had to be good on-road and quiet as well. 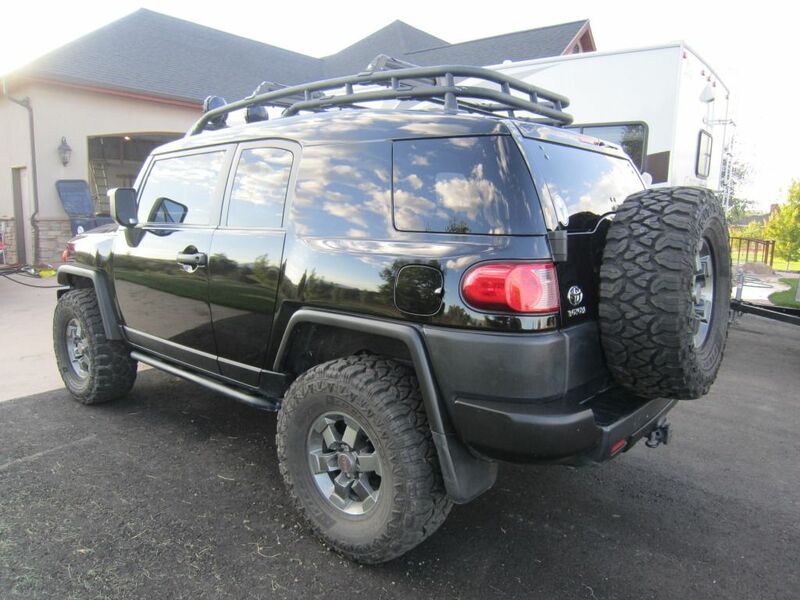 I looked at basically all the most popular brands of MT tires including Nitto Trail Grapplers, Toyo Open Country MTs, Cooper Discoverer STTs, and so on... but in the end, after seeing bc indiana's setup on here, I decided what I was going to do. 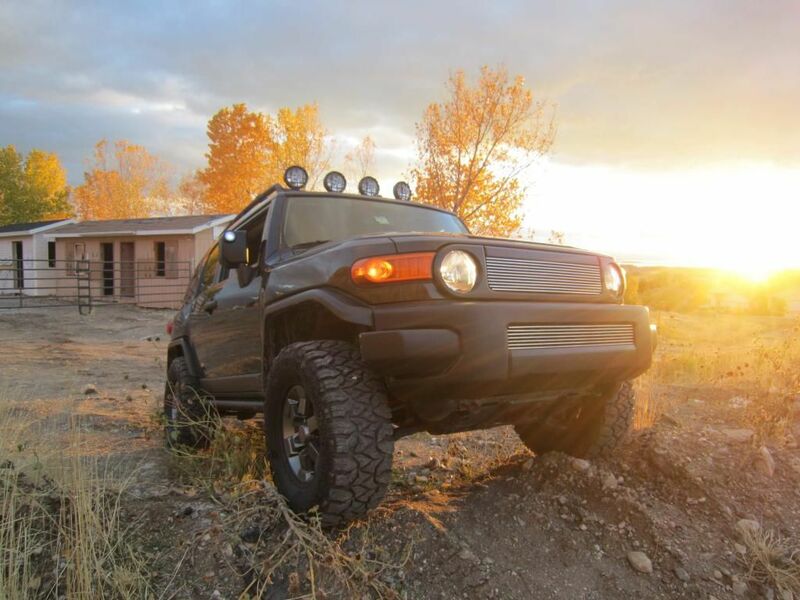 Plus on offroaders.com, the Fierce Attitude got higher ratings than both the Toyos and Nittos as far as performance on the terrains that concerned me the most such as on-road, mud, rocks, trails, and snow. 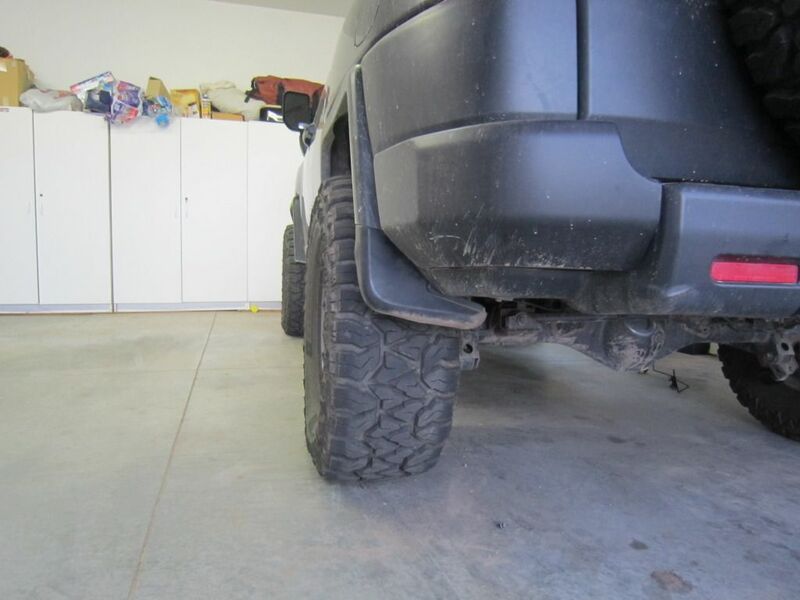 Plus, they were a much cheaper option than both of the Nitto or Toyo tires were! So, in the end, and after running them now for thousands of miles, they still are very quiet for a MT, they run amazingly, I love them both on-road and off-road, and they've never let me down! I cannot recommend these tires enough! 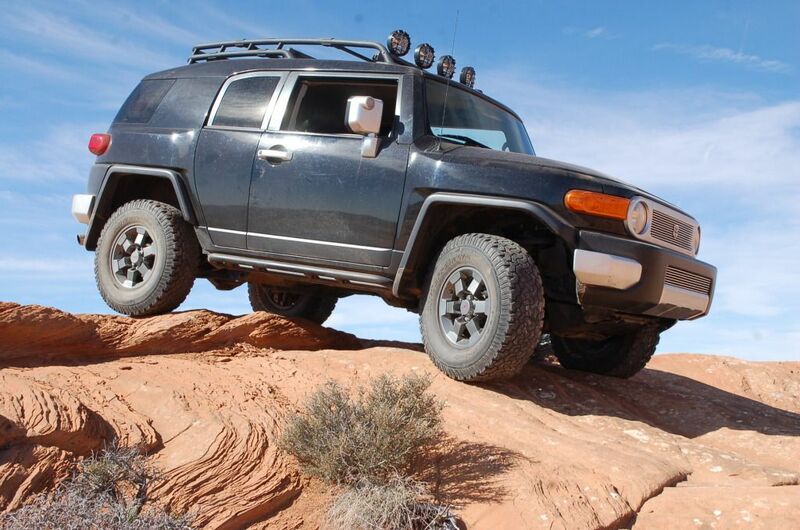 If you're looking for a super capable tire that is quiet on the road and does amazingly with any off-road terrain you throw at is as well as doing good in the snow and ice, the Fierce Attitude should really be a consideration for you when deciding on tires! Now I know most people go with a 265 to 285 size tire or even a 295 when they have a setup similar to mine (3" lift) but because I like to set myself apart from the crowd, I went with 305/70R16s. 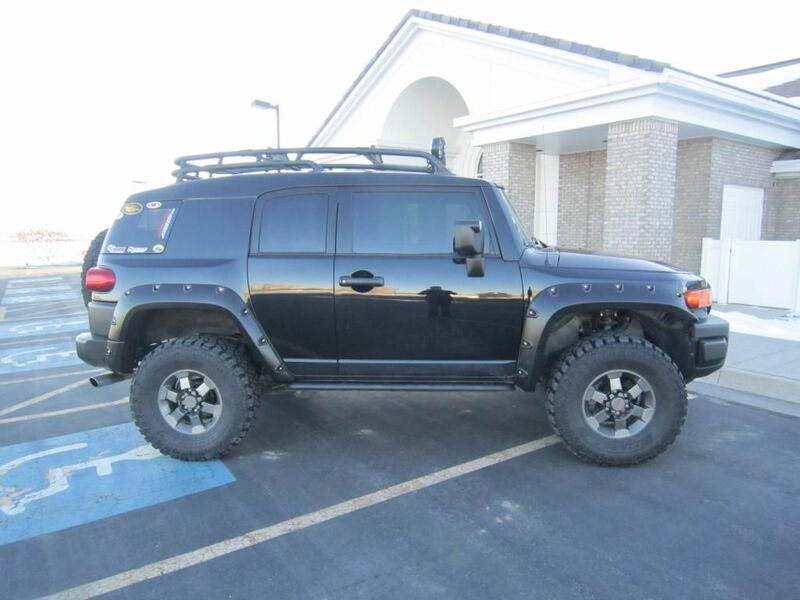 This is basically a 33x12.50R16 tire, so wider than the 285 and 295 but the same diameter as them (if not bigger from some side by side comparisons I've done) and they're on the 16x7.5" TRD wheels. 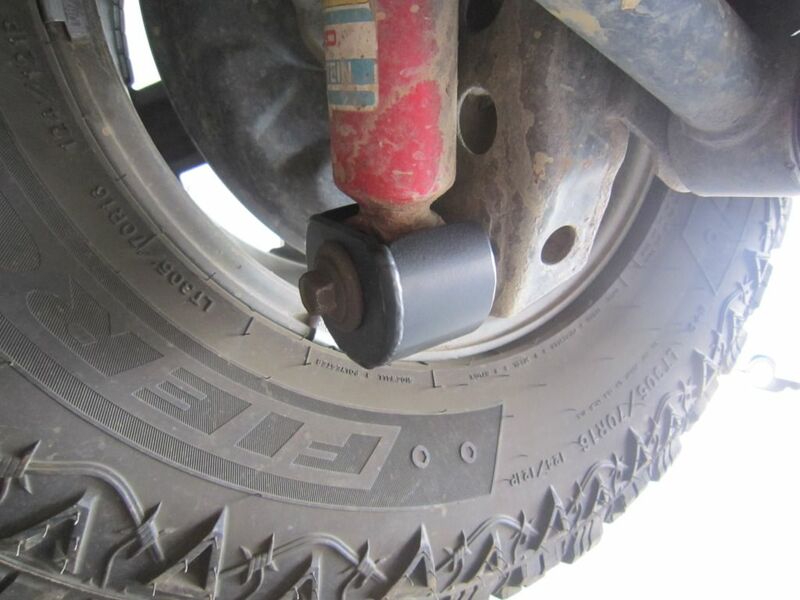 Some will argue that with that wide of a tire on that narrow of a wheel, you'll have steering issues, like your ride wont be as steady on the highway, or that you wont be able to have full ground contact with the entire width of the tread, so here is what I've experienced. As far as the tread goes, with this wide of a tire on that 7.5" wide wheel, at 36 psi, you will not have full ground contact, but with the tire being an E rated tire, meaning it is a lot stronger/stiffer tire than a C or D rated tire, you can air down a little to gain that full ground contact and you wont feel any difference on the road. 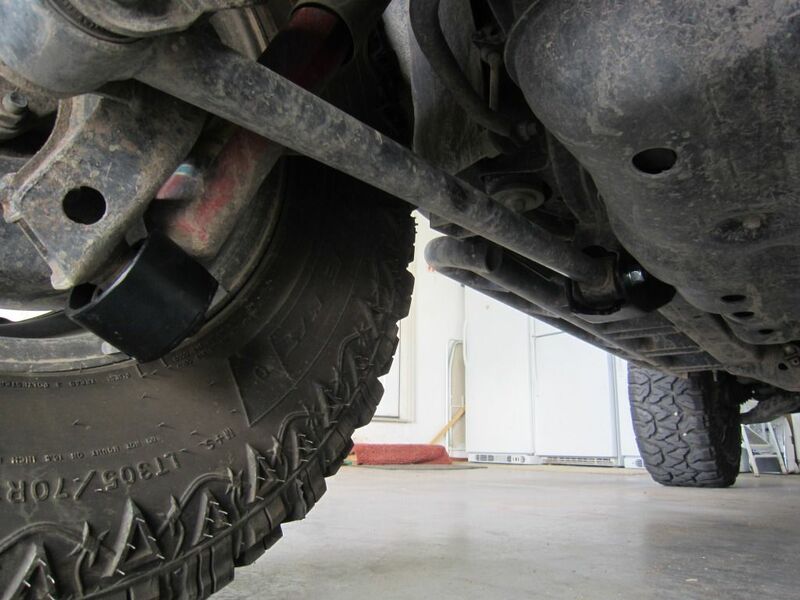 I've driven great distances on the freeway just 20 psi after off-roading and it wan not bad at all, driving without a sway bar feels much more unsteady and dangerous than driving on lower tire pressure with E rated tires. But personally, I just always run my tires at 36 psi on the road and there hasn't been any odd of unusual tire wear, but if this really concerns you, just get an 8" or 9" wide wheel, problem solved. 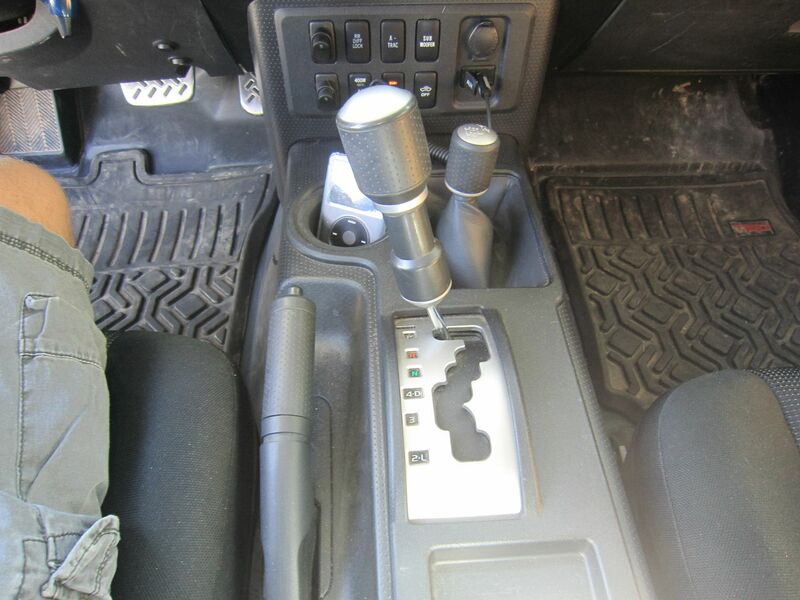 And as far as steering, I've had no wandering issues or anything as far as I can determine. Now to get this tire size to fit, I of course got the body mount chop done, this is just something that has to be done with this wide of a tire and also since I have wheel spacers. I also just had my body mount chop done by a friend of mine named Dart Nelson. 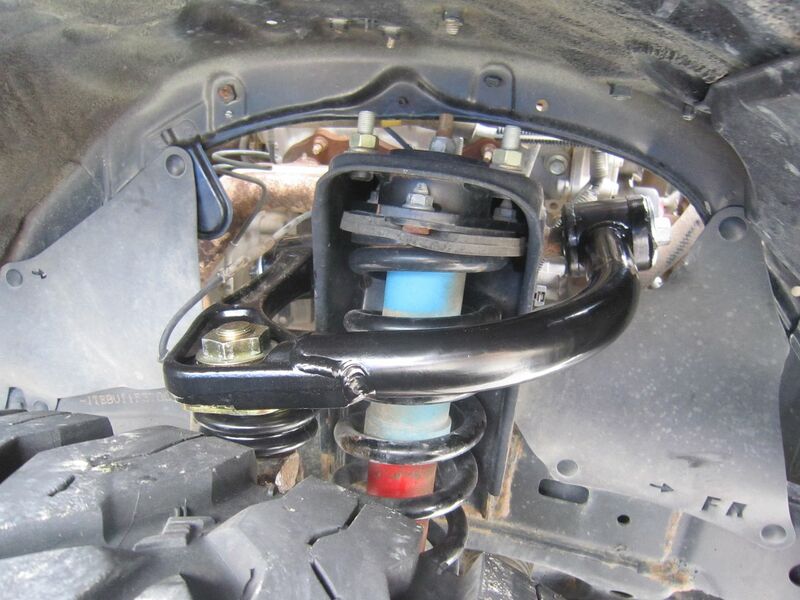 Also, so there wouldn't be any rubbing on the stock upper control arms, I got 1.25" Spidertrax wheel spacers. 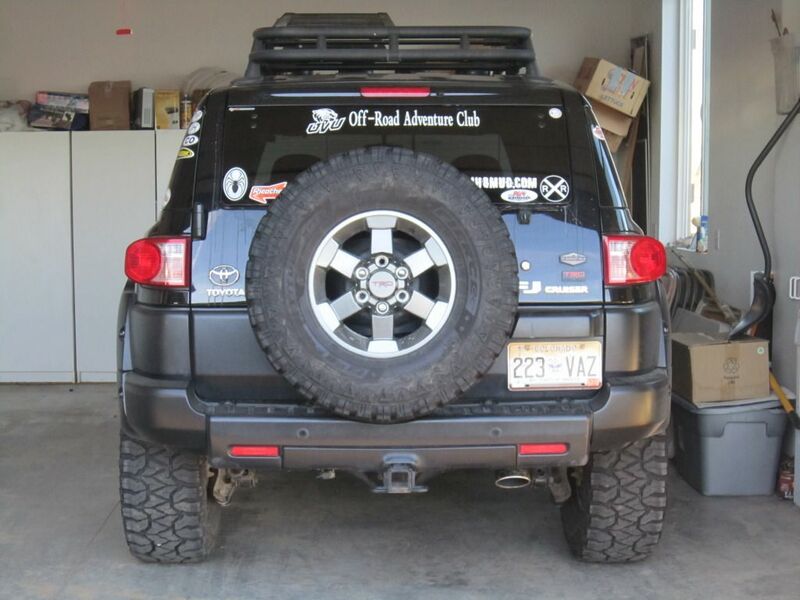 Forum member bc indiana (the person whose setup I copied) has the same tire/wheel setup just like me, but at first, he didn't have the 1.25" spacers, and after about 2 months he noticed that on the front of his stock UCAs, the paint had been rubbed off from where the tires had been rubbing at full lock. 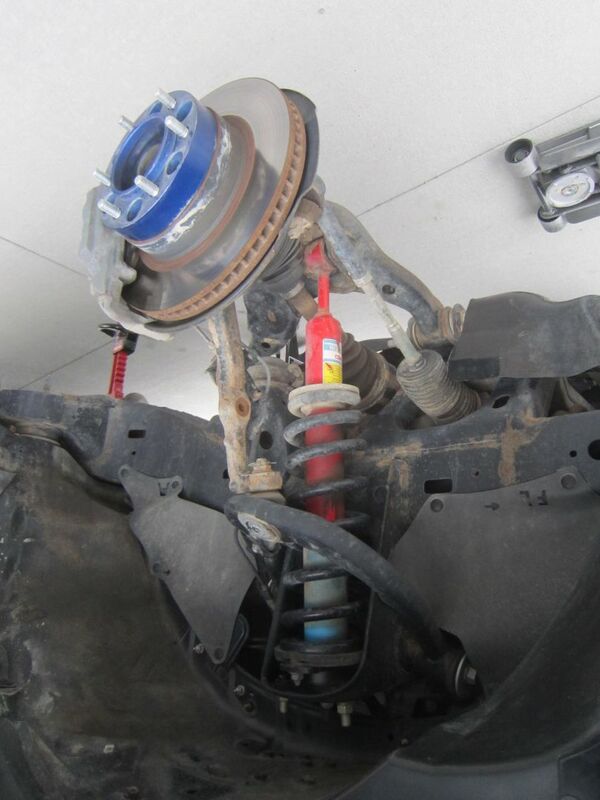 This wasn't causing any driving issues or anything, but to avoid contact between the two, he got Spidertrax spacers too, and that solved his problem immediately. 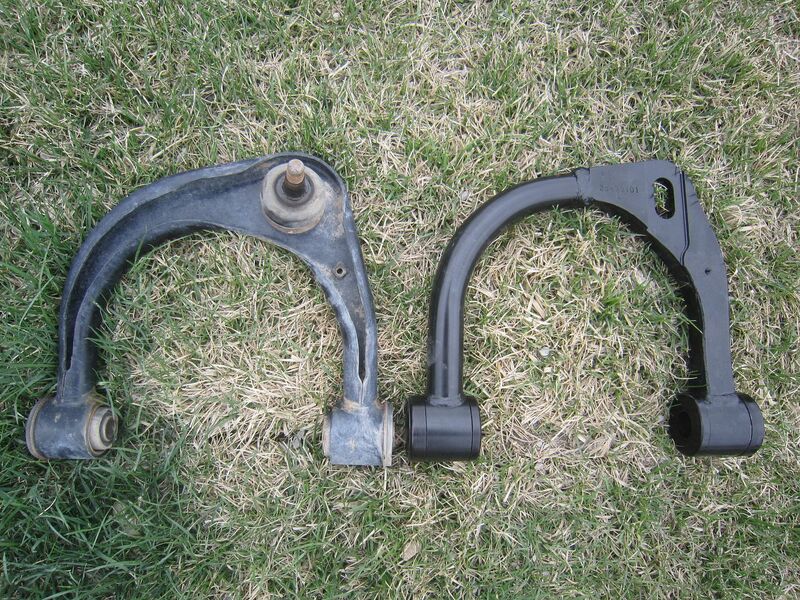 Now one could either go this route of getting spacers, or you could get a lower profile upper control arm, such as the tubular ones that so many companies offer. 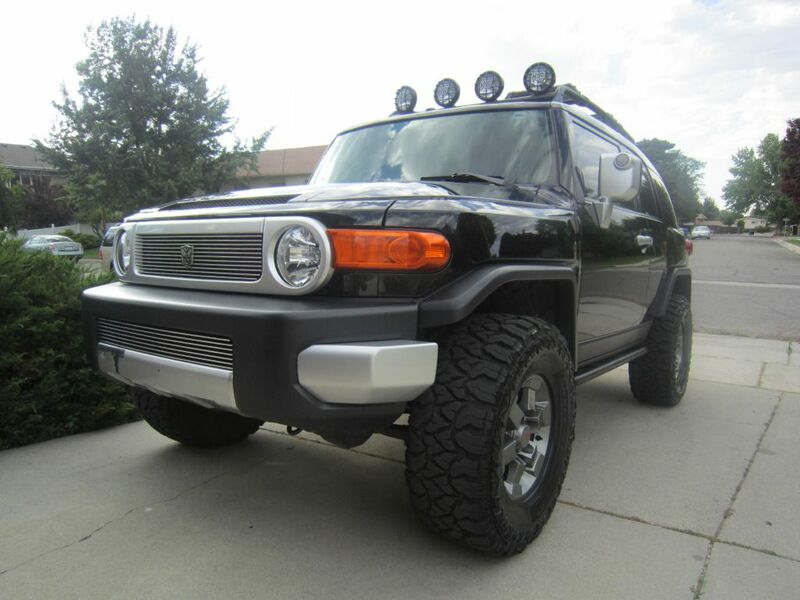 And this photo shows the FJ after a sweet full detail I had done. If only that silver on the bumper valance didn't make it looks so crummy! This next picture was taken shortly after I got my 5th tire and also, that Transformers emblem had fallen off due to that Arizona heat after going down to Lake Powell for a few days, but I liked the look without it because of how much cleaner it looked, so I never put it back on and now the emblems just sit in my garage. 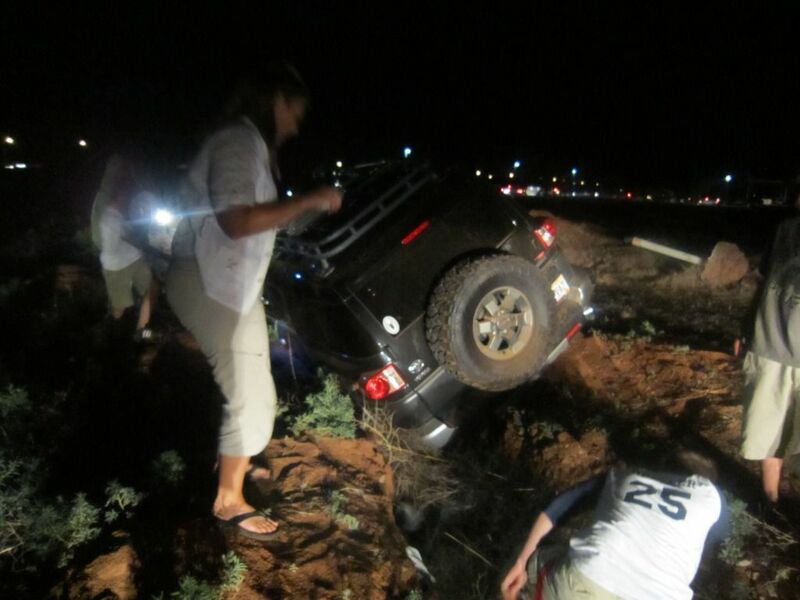 But then on the 4th of July in 2012, as I was parking in the field where people parked so that they could view the fireworks show in the little town of Blanding, UT, I drove right into a ditch that was hidden by the tall grass. 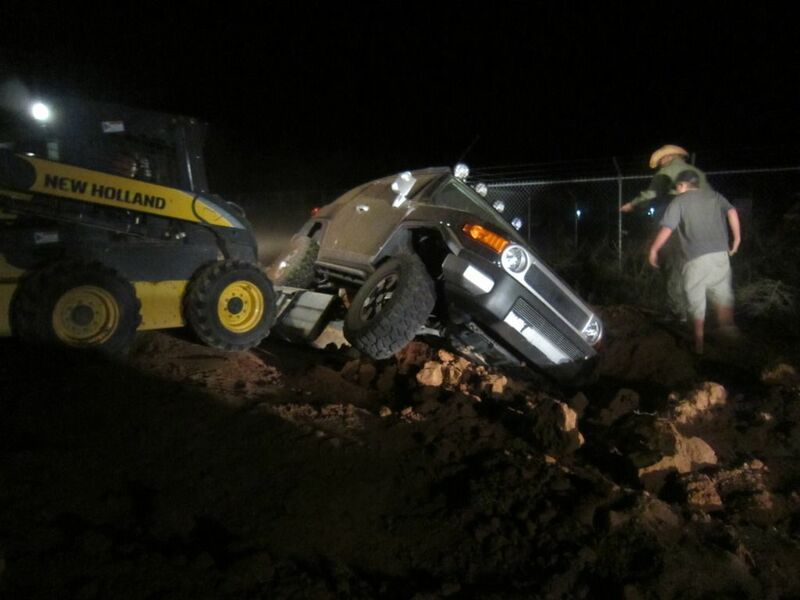 The FJ was totally stuck with no way of driving out or getting towed out. Because it was a small town though, people were willing to help and soon 2 people with tractors showed up to dig me out. One thing that stunk though was that because my window was rolled down when the accident happened, it wouldn't roll back up all the way. 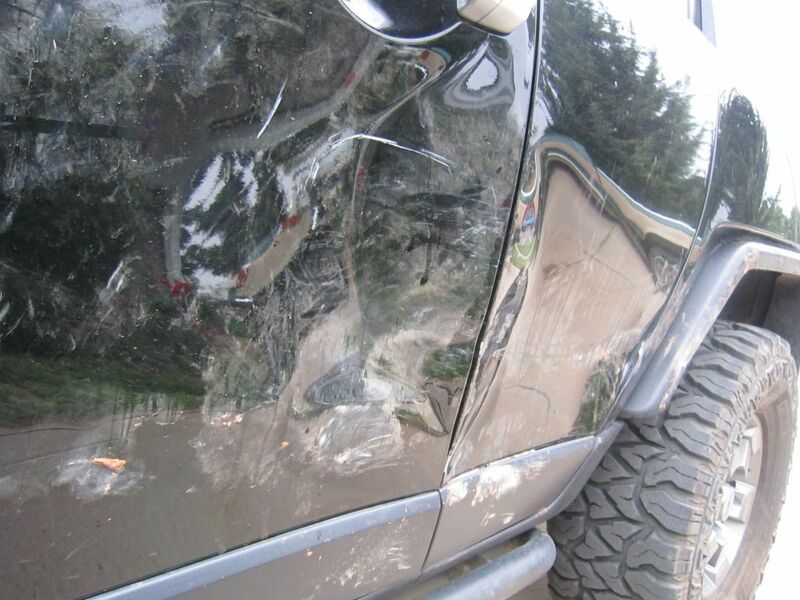 Then just the fact that my drivers side doors and fenders were all messed up really made me upset. I mean who puts a 4" deep drainage ditch in the middle of where people are parking!? 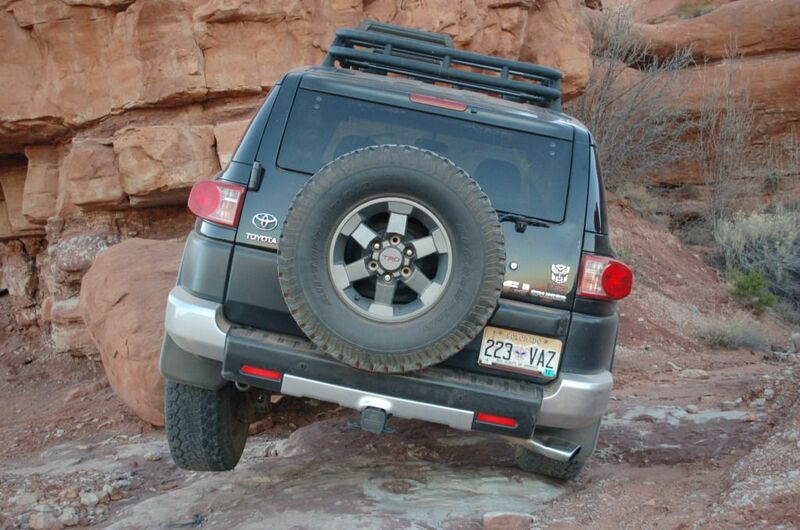 What also was a bummer was the fact that the 2012 FJ Summit No. 6 was coming up fast and without a properly working/looking FJ, it's hard to attend an event like that and have a really enjoyable time. 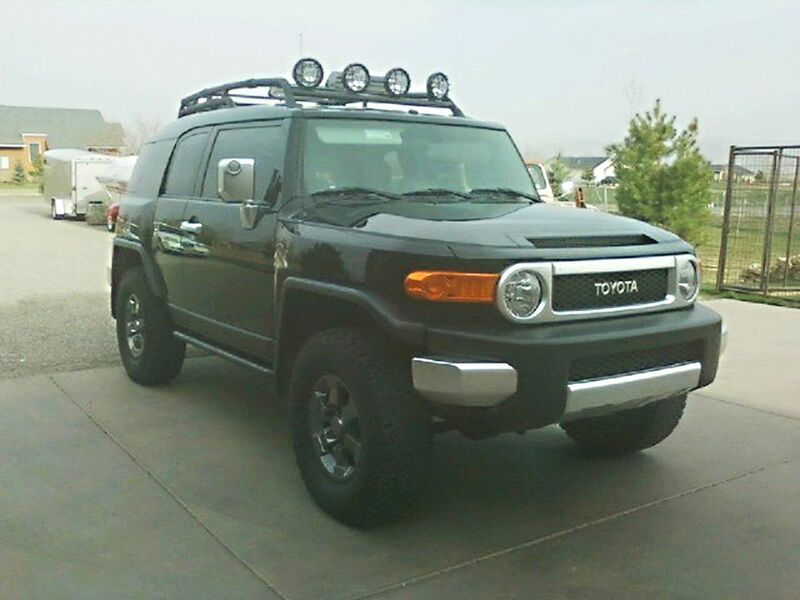 So as soon as I could, I took my FJ to a body shop to get fixed. 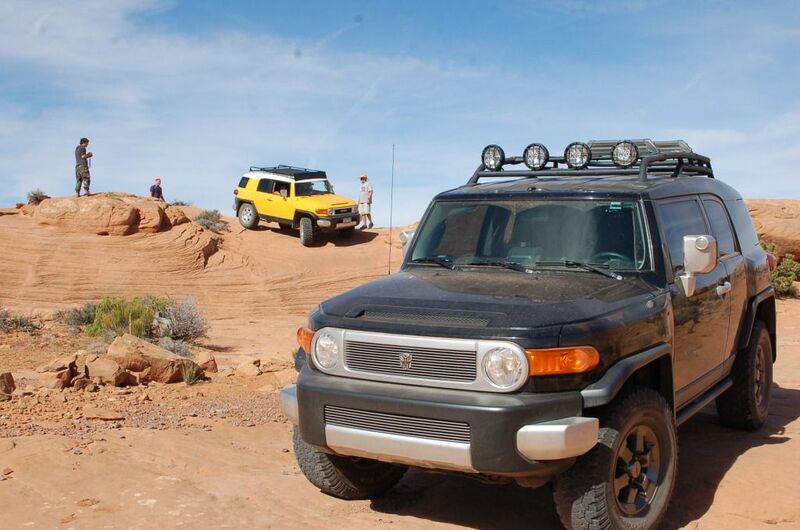 Luckily, because timing worked out perfectly, I was able to pick up my car from the shop the day before the Summit and I still got to hit the trails, get some goodies, and meet some pretty awesome people on Saturday and Sunday at the Summit! 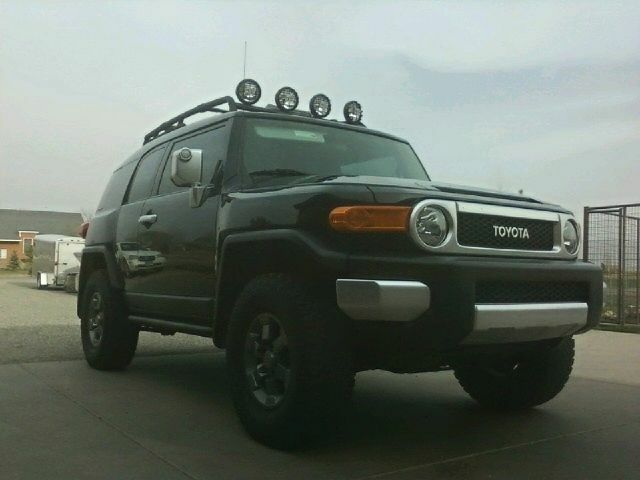 But when I got my FJ back from the shop, this is what it looked like! Since they were already having to repaint half of my car (they also were able to fix a dent I had in my rear door from someone pushing on it too hard when I got stuck in the snow) I just told them to black it out, and that's exactly what they did! 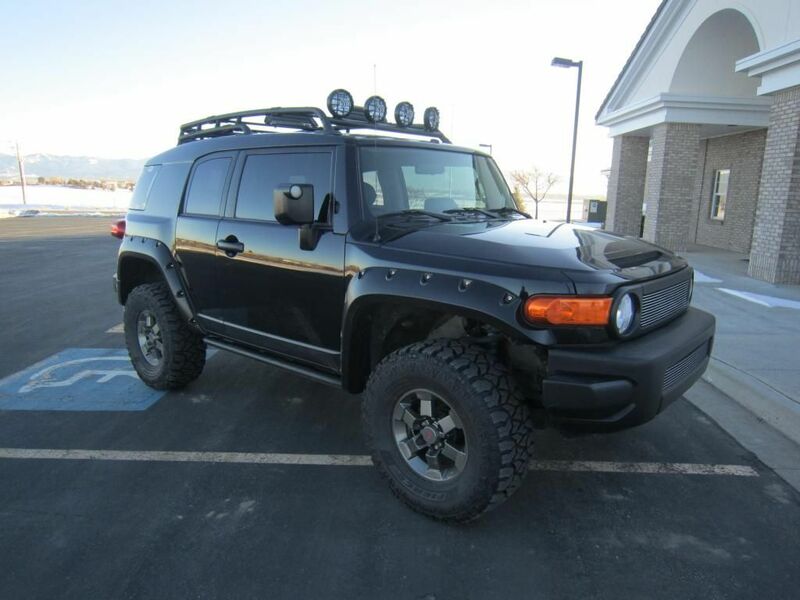 I finally got the blacked out FJ I had always wanted! They did a fantastic job with it too and I loved the outcome! Here is a picture of me on the steps of Black Bear Pass at the Summit in 2012! 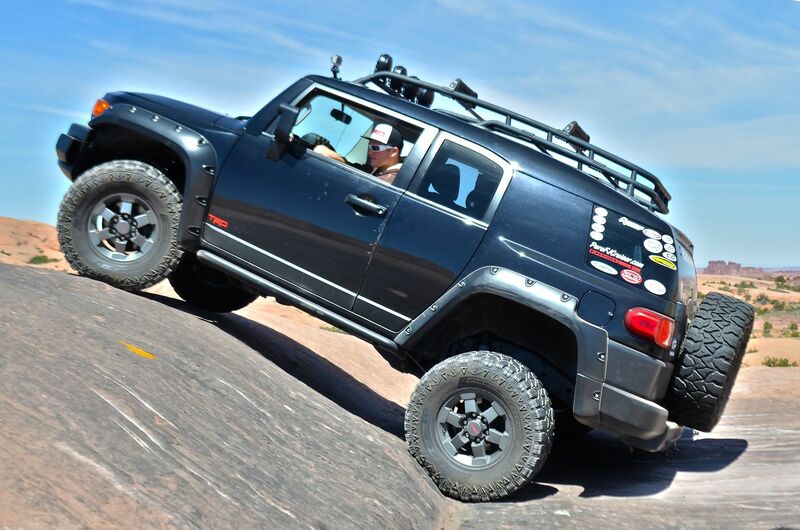 While at the FJ Summit, I was able to purchase some Rocktek front lower link armor and rear shock mount armor from @WILSON at the TRDParts4U stall that I installed soon after the Summit. This was a very good purchase and I recommend these items highly for anyone because I have personally used and abused that armor! So glad I have it! Last edited by FJX2000; 12-07-2016 at 03:42 PM. Continuing from the last post, I also took off my rear mud flaps and replaced them with my front ones which I had taken off for my body mount chop a while before. With it like this, I liked the look a lot more, and not only does it show off more tire from the rear, but it looks balanced out better since there are no flaps in the front. I also decided to sticker up my car with all the decals I got from the vendors at the Summit. 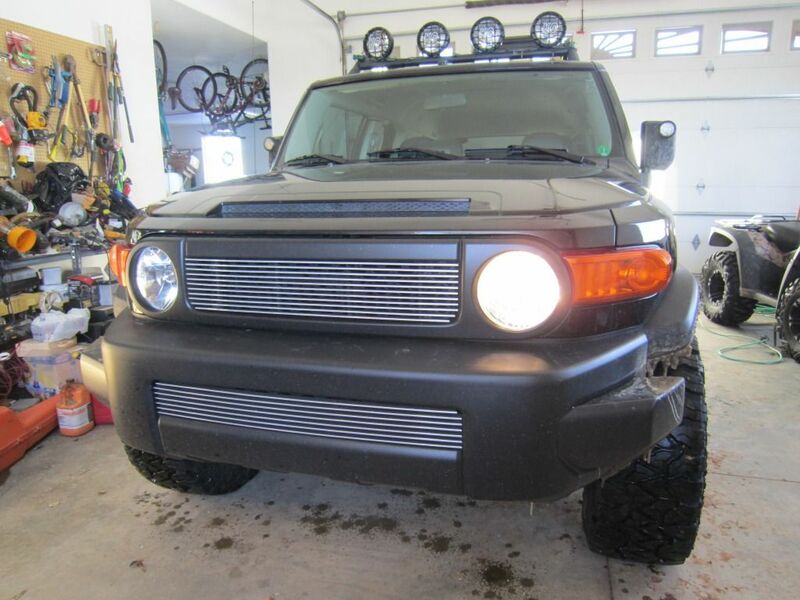 And as you can see below, I got some 3M tape and I put it on the FJ Summit No. 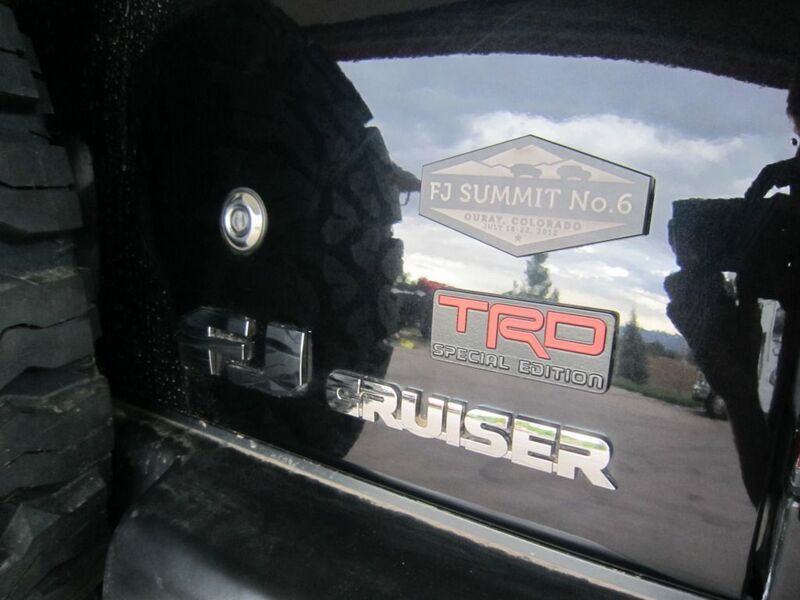 6 tag and then installed it right above the TRD emblem. Recently though I had the Summit decal removed and the place that did it totally dinged and scratched my back door! You would expect it to look like new or that they would offer to fix it but they deny doing it and don't even offer! Ugh! I also installed a resistor to my 3rd brake light that I bought off of eBay around this time after seeing a similar thing of someone else's rig at the Summit. This makes it so whenever I press on the brake pedal, while the normal brake lights come on as they originally do; the 3rd light blinks rapidly for a couple seconds before going solid. 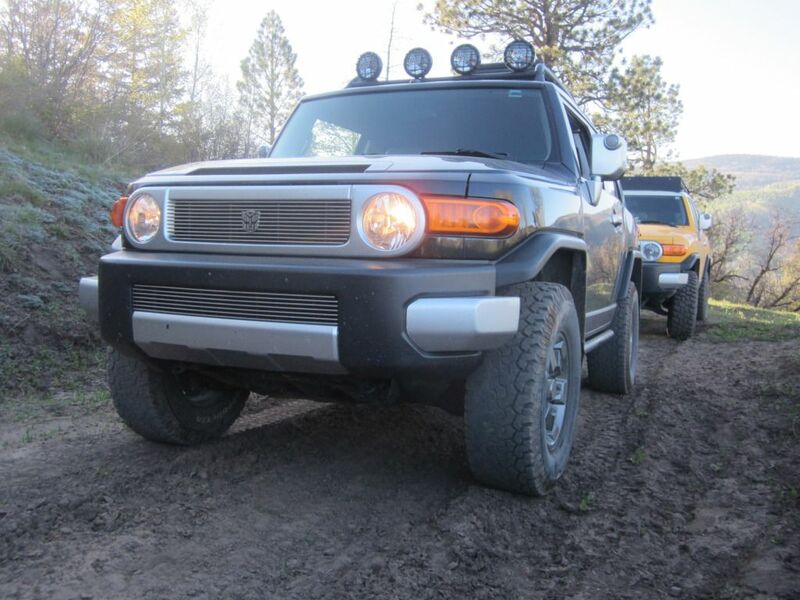 Here are some videos of me messing around on a pretty easy trail but it shows my rigs articulation (which isn't much compared to others) and in the first video you can see that 3rd brake light blink. Because of the quality however, it looks like the blinking is lagging or doing weird things but in reality it looks good and is steady and quick. 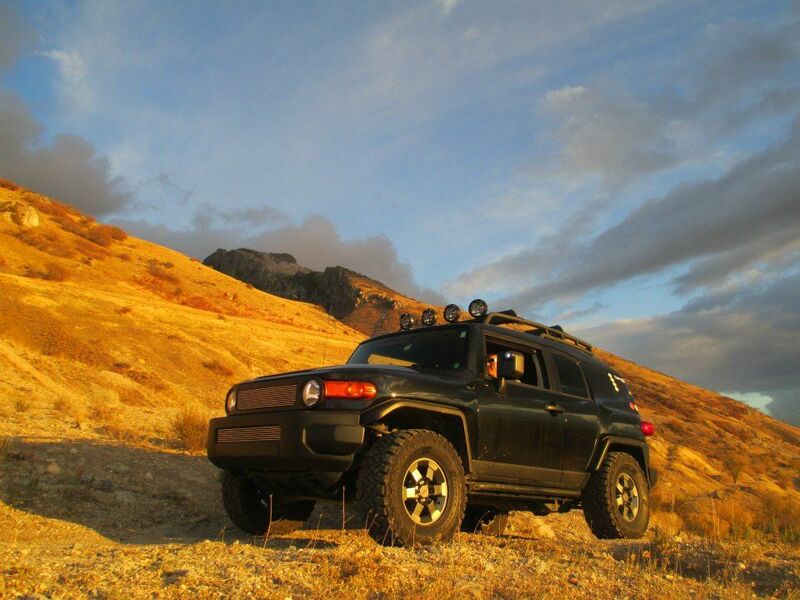 I ended up saying bye to Colorado for a little bit to co to school in Utah and while there I started an off-road club at Utah Valley University. Here are some pics I took while off-roading near where I was going to school. From this point on, you can find further modifications and trips I've done later on in the build thread in more detail, but here are some of the more major mods! After the low beam filament in one of my headlights burned out, I decided it was a great excuse to get HIDs so they would match my "cool white" LED mirror lights. 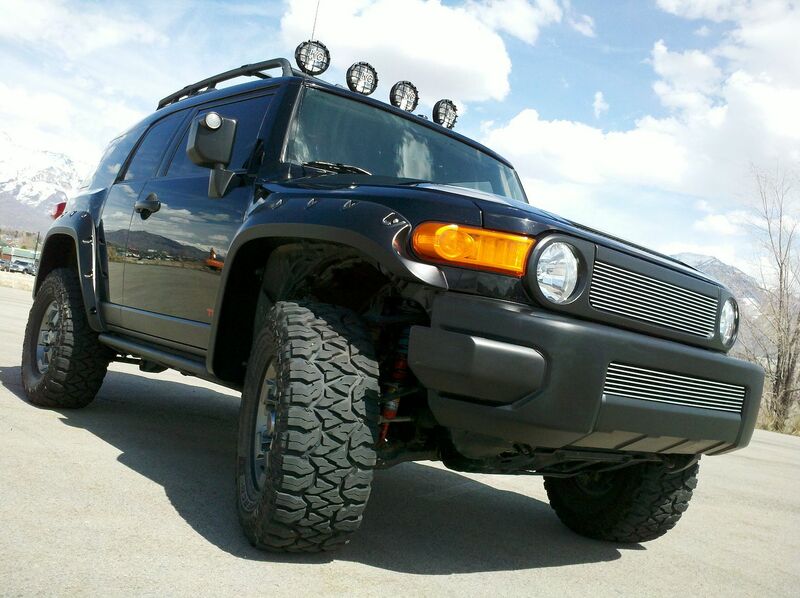 I chose an 8000K 55W HI/LO HID kit from DDM Tuning. 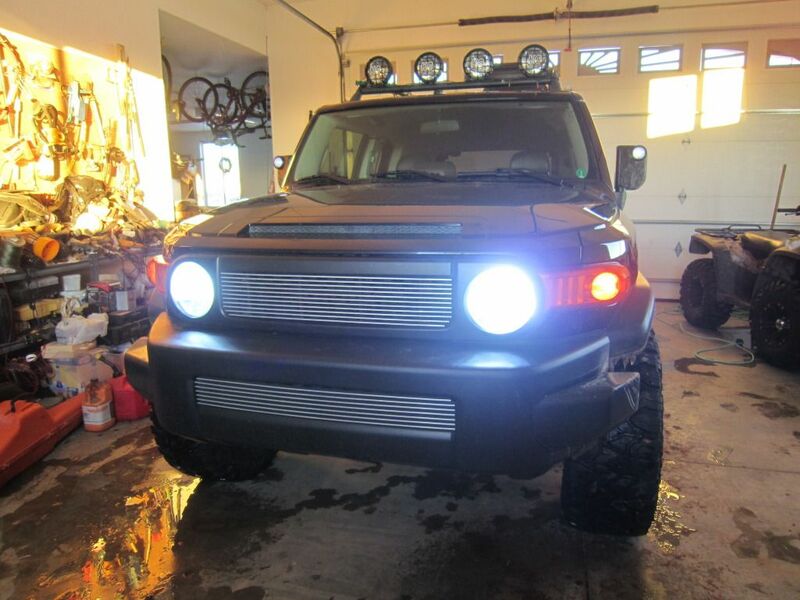 Below is a link to my install thread of these lights. These are a TON brighter that the stock headlights and you may need to adjust them down a little so oncoming traffic isn't blinded! 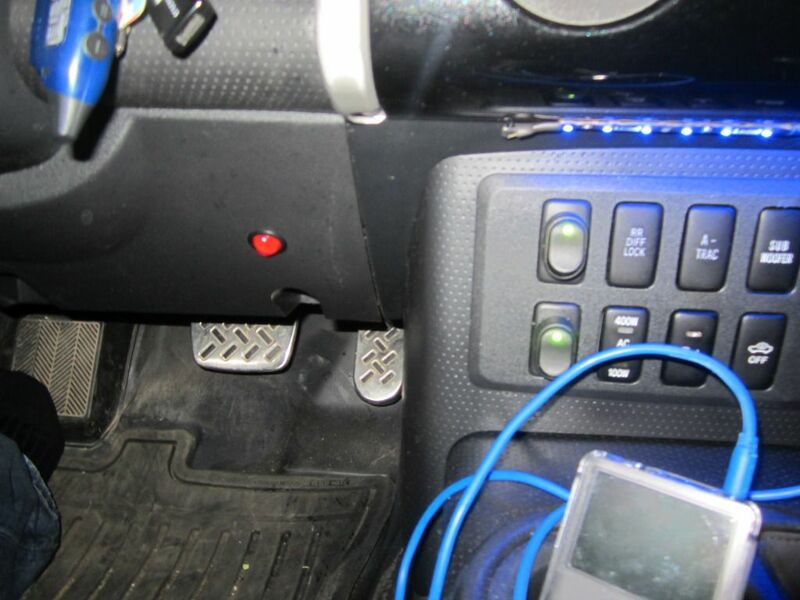 Also, I added a daytime running light switch to my FJ right below where my center console light switch is. I did this because of the following statement from an HID manufacturer. 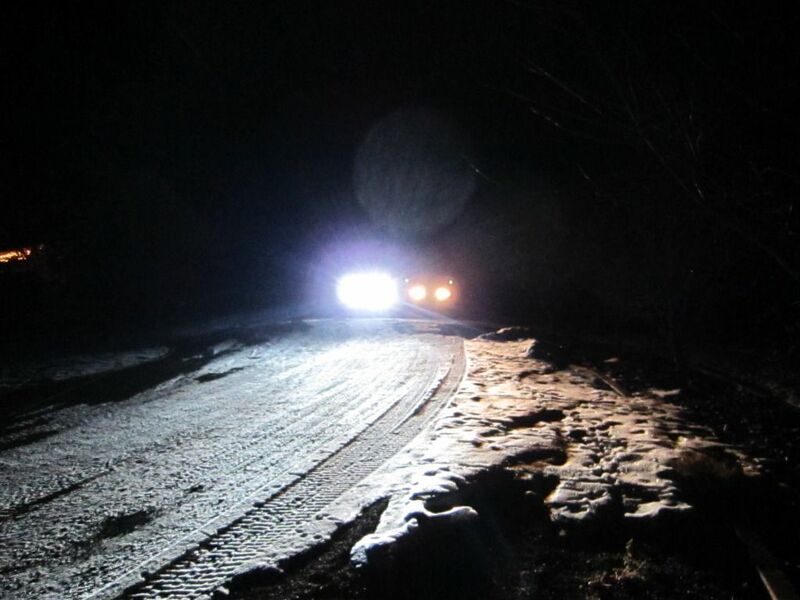 "For vehicles with DRLs that use the same bulb for both the DRLs and the low beam (or even the high beam) you will need to deactivate your DRLs. The DRLs operate on reduced wattage or fluctuating current levels. This will cause the HID system to flicker and burn out prematurely. Please ensure that your OEM headlight harness is providing a constant 12V to ensure that no damage will be caused to the HID system." 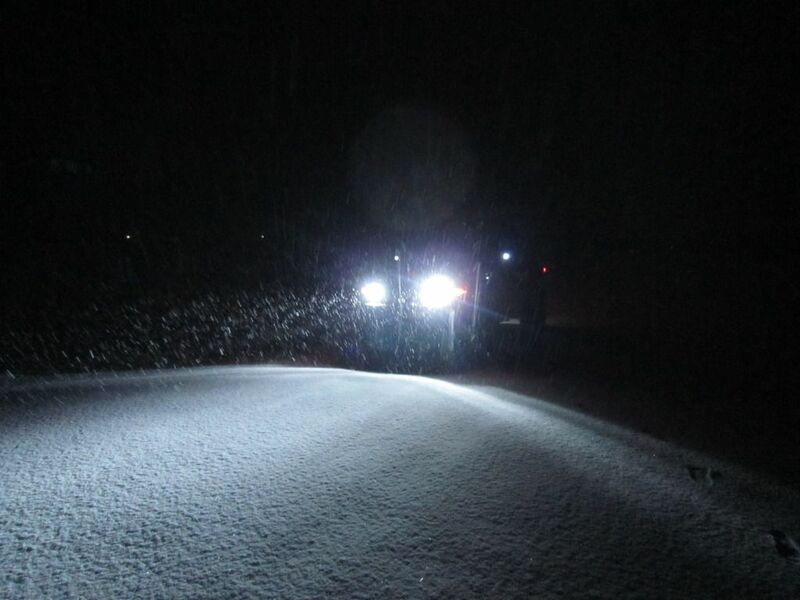 So this is why I have added a DRL switch and why I never have my lights on as I start the FJ. I will turn on the DRLs occasionally while passing on the highway or in other situations but I usually never run with them on. 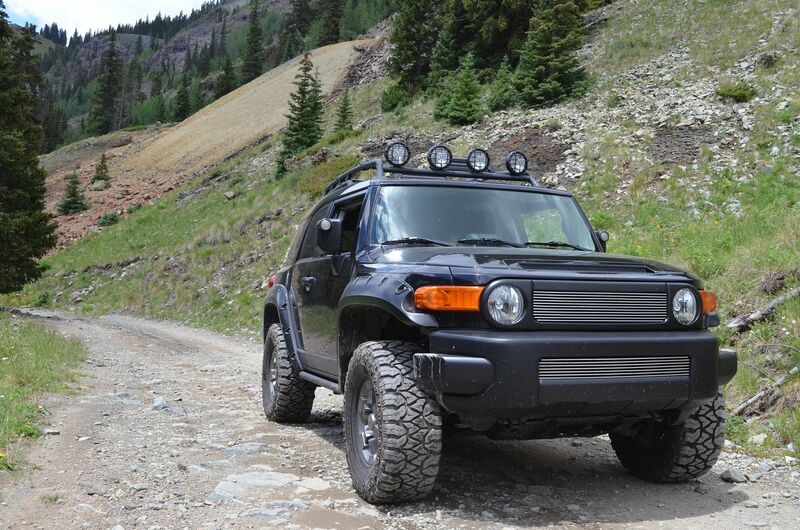 Stock FJ headlights compared to the HIDs. 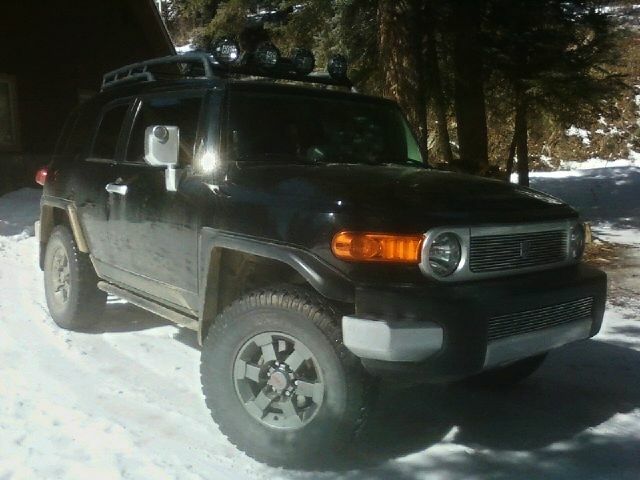 My next mod was some Bushwacker Pocket Style Fender Flares I got for Christmas! I got to install these myself and I love the look! 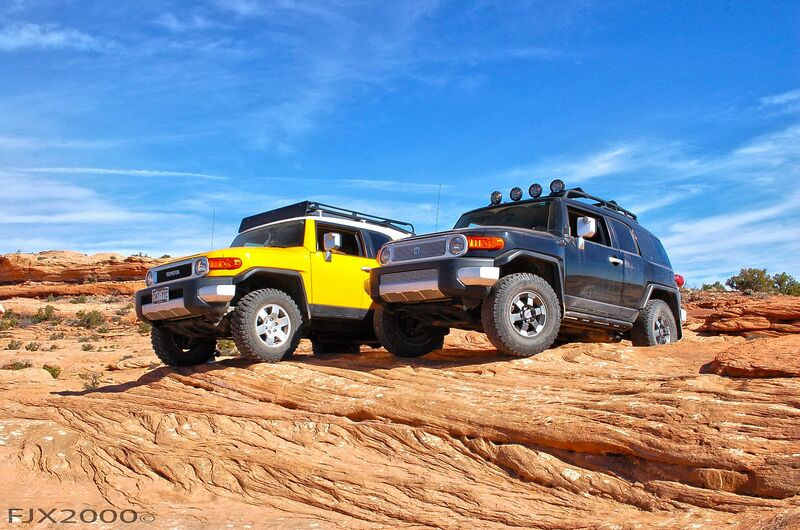 They allow more tire clearance in the front and rear when articulating and they make the FJ look taller! They also will help prevent rocks, dirt, mud, etc. from being thrown up onto the sides because of how wide my tires are so that was a plus. 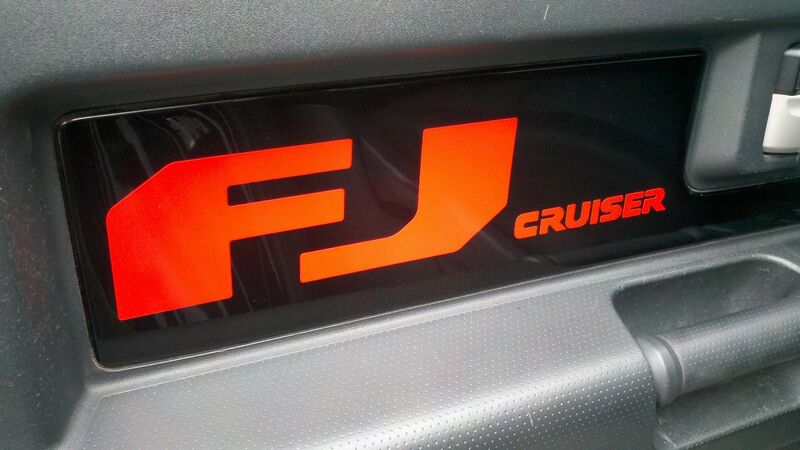 I then got some new sticker decals made up for the FJ that are pretty sweet and match the red of the TRD perfectly!! Thanks Jord810!!! 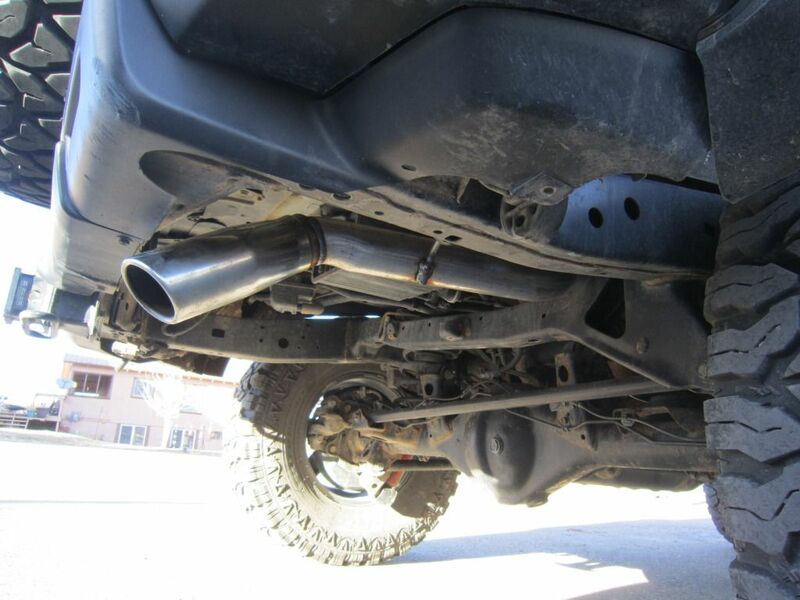 Next, I got my TRD exhaust tucked! 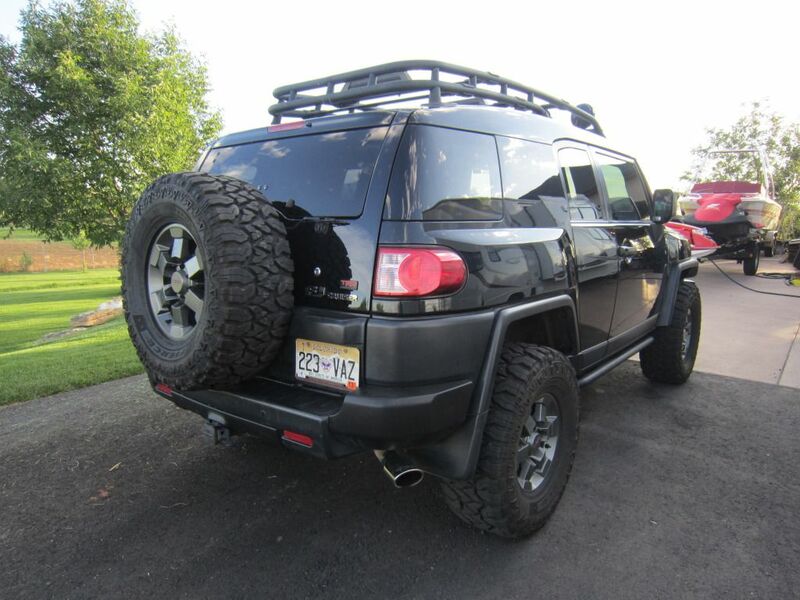 As many of you know, the way the exhaust sticks out in the back is VERY EXPOSED and I've heard about people just crushing theirs completely while wheeling. 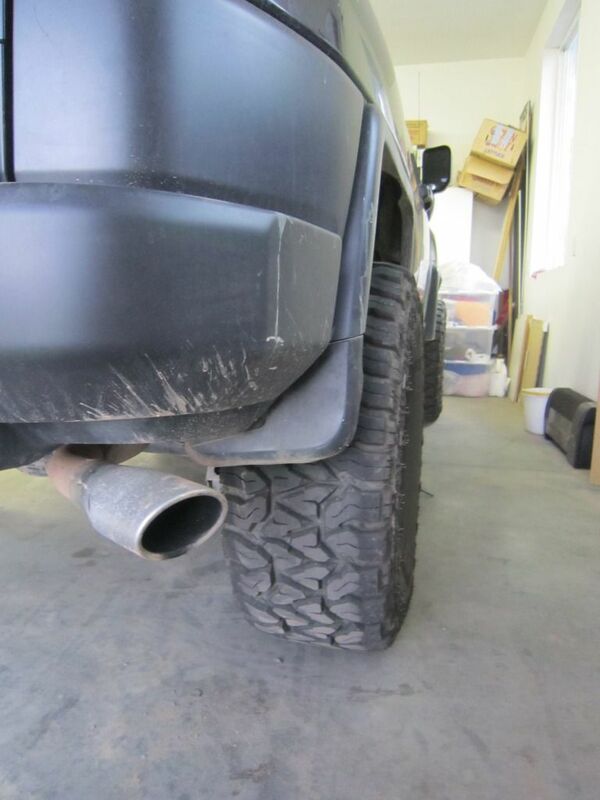 So after rubbing the exhaust tip a little to hard for comfort on an off-road trip, I finally decided to solve the problem!! 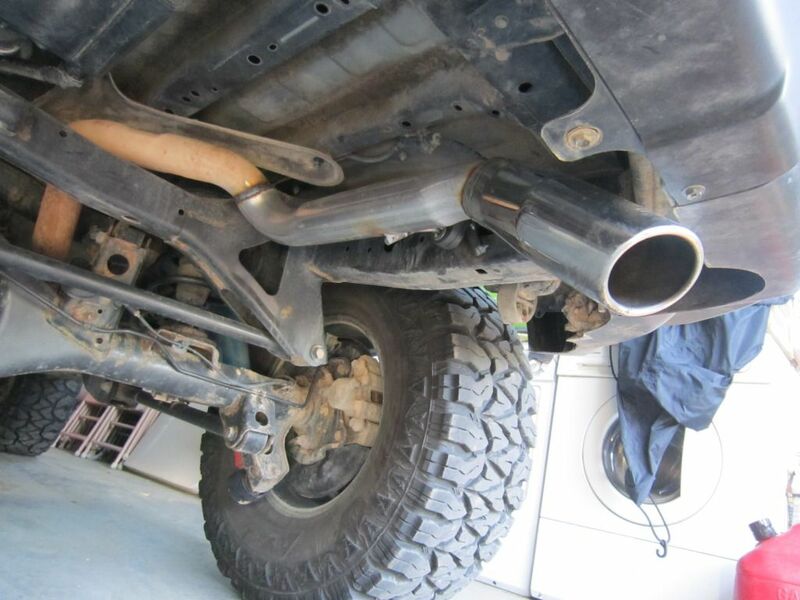 I just had a local shop do the work and what I did is I showed the guy at the shop a picture on my computer of Joeisip811's TRD exhaust tuck and he basically duplicated it how I wanted it! Got some brand new Drake Off Road Shift Knobs from Pure FJ Cruiser! They are sick! 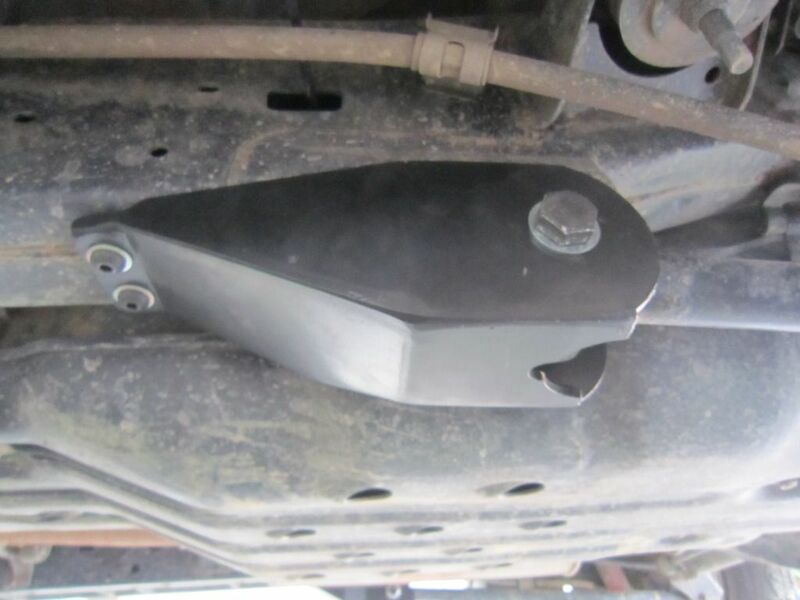 They are made form 6061-T6 billet aluminium and they're anodized black! I just love the tread pattern on them! Love these things! I ended up trading my old broken 3rd member and e-locker for some brand new Light Racing upper control arms, what a deal!!!! It was just a straight up trade, no cost at all!! Last edited by FJX2000; 12-07-2016 at 04:14 PM. FJC looks great man. Definitely some ditch you were in there. 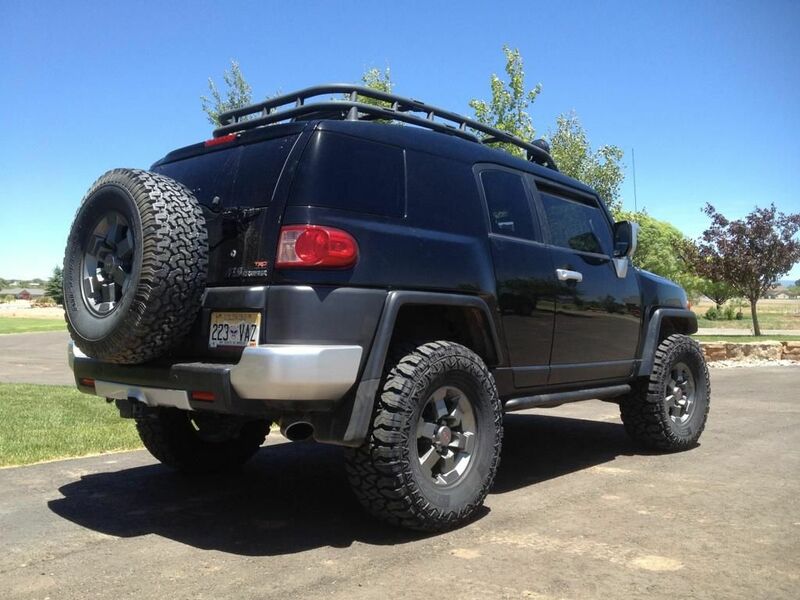 Looks nice & I like the fact that you have kept the TRD wheels! 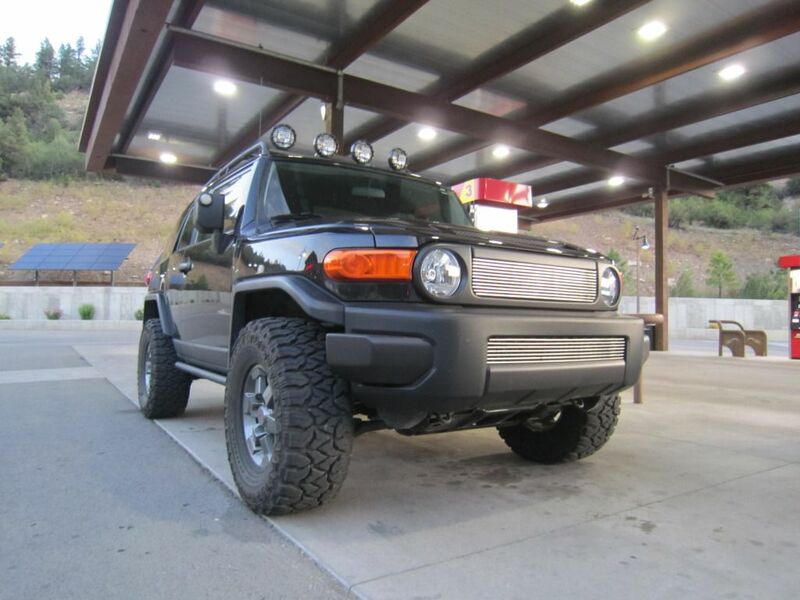 Hey Hayden - It was good to meet you the other day at Maverik in Moab. You've got a nice looking rig!